These egg bites are such an appealing idea, especially as a protein-packed on-the-go breakfast, that I came up with my own version instead. 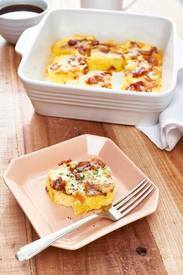 The result is creamy and rich with crispy Bacon and Gruyère cheese, and can be eaten out of hand. Oh, and the best part is that you don't need a sous-vide machine to make these!